At Stephenson Park, neighbours have come together to build a community ice rink. On Sunday, they host their first skating party. You don’t flood an ice rink. You mist one, finely. The hose weighs heavily in my hands. The evening air snaps my cheeks. The neighbourhood ice-making crew stretches behind me like posts in an electrical line, holding up the hose so I don’t trip. “It’s like eating a cob of corn — you go from one side to the other,” suggests Peter Woodcock over my shoulder. Vernier and Woodcock are married. They live right across from Stephenson, a scrappy little park near Main Street and Danforth Avenue. From their porch, they’ve witnessed drug deals by the swings and an armed police takedown in the baseball diamond. They decided to stage some interventions last summer — morning yoga sessions, a neighbours’ movie night, an opera singer accompanied by a harpist one evening in the park. What drug dealer wants Madama Butterfly as his soundtrack? The strategy seems to be working. Good begets good, says local crime prevention officer Jon Morrice. He’s using the park as a model. Then winter descended. The Friends of Stephenson Park’s thought process went like this: “Oh, gee. Now what do we do?” says Woodcock, 53. “We make a rink, what else!” Neither Woodcock nor Vernier had skated in a good 30 years. They don’t have kids who skate because they don’t have kids. So, it goes without saying, their ice rink building experience was wanting. Community ice rinks are advertisements for how Toronto’s Parks Department should work. No complicated paperwork, no hefty insurance — all neighbours need to get the go-ahead is a team of volunteers. Parks staff even supplies all the equipment: hoses, scrapers, shovels, pylons, flashlights, plastic gloves and a tool box. It should be free and it is, which is fabulous but unusual in our city today. We finish misting the rink with water. We have to wait 30 minutes, I’m told. That’s how long it takes for the layer to freeze. And we can’t nip home to defrost, because we need to guard our work. The clear ice is just too tempting, especially when the lights reflect off it and the night is still and you feel like you are beside a lake. “One night, 20 teens came out of nowhere, running to the rink,” says Vernier, 57. If it’s too cold, the ice makers huddle in the park shed around some space heaters they’ve hooked up. It’s here the team conducts its ornate ritual of putting the hoses away. Any water left inside them will quickly freeze, meaning no ice-making tomorrow. They hang them, and heat them and blow dry them with a shop vacuum, borrowed from a neighbour contractor who has since become a friend. This is how a community is built: one misted layer at a time. 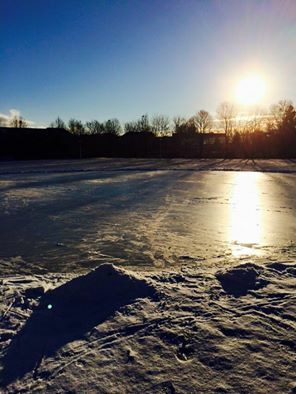 On Sunday, the icemakers are hosting their first Stephenson Park skating party. They’ve rented some lights and taken out a bonfire permit. One neighbour kicked in money for supplies, another is making cookies. There will be hot chocolate. Will Woodcock skate? “I went out for the first time last Saturday. My little 10-year-old neighbour joined me,” he says. They were alone on the rink. The sun was bright. He was nervous at first, but then it all came back. “It was exciting. My heart was racing. I was laughing . . . the joy of it all.” In other words, of course he will skate. Join him in Stephenson Park this Sunday, from 2 p.m. to 8 p.m.